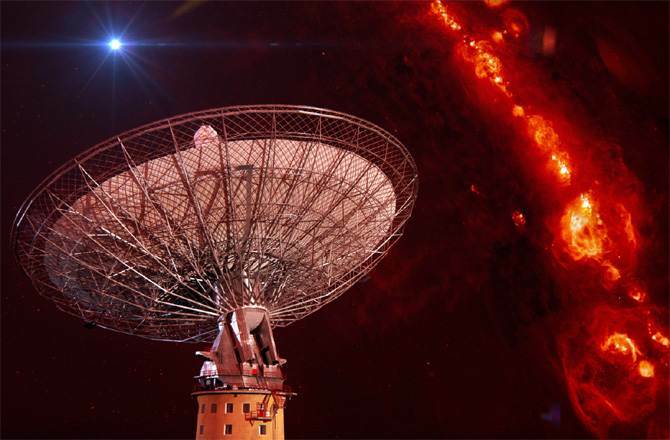 The mysterious flashes of radio waves arising for billion light years from us from depths of the Universe, throughout long time were nonplused scientists. The radio waves forced the scientists to put forward the most improbable theories about their origin. The international research group excludes possibility of existence of terrestrial sources for four splashes in radio waves. Astronomers claim that brightness of splashes speaks about their origin from cosmological distances when the Universe was twice more younger, than now (about 6-9 billion light years). Being accompanied explosion, they shows that come from large-scale astrophysical events with participation of relativistic objects, such as neutron stars or black holes. The leading author of research Dan Thornton from the Manchester University and the Australian scientific organization CSIRO noted that it can be any space cataclysms and the extreme events. These events can be connected with big weight or energy of objects participating in them as a source of radio splashes, for example merge or death of stars, eating of stars by black holes. By the words of Thornton the first splash in a radio emission of an unknown origin was found outside our galaxy about six years ago, but then nobody was confident even in its reality. Flash lasted only some milliseconds and did not repeat any more. So the next four years the scientists spent for search of these short-term sporadic radio waves. Only then the scietists received three more signals and were finally convinced of their existence. Most distant of them came for 11 billion light years. Other author of research, Professor Matthew Bailes from Suinbern’s Technological University, considers that the origin of these explosive splashes can be from the neutron stars known as magnetar. According to him, magnetars can emit in milliseconds more energy, than our Sun allocates for 300 thousand years, and therefore are the best candidates for sources of radio waves. Scientists say that results of their research also will help to learn about properties of intergalactic space which is dissected by radio waves.